Pope Francis Stresses the Need for Positive News! 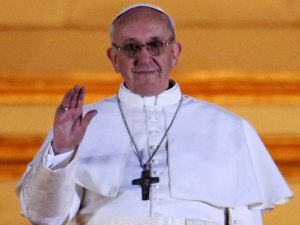 "The media should give more space to positive, inspirational stories to counterbalance the preponderance of evil, violence and hate in the world," Pope Francis said on Thursday in his year-end message. Francis led about 10,000 worshippers in a traditional year-end solemn "Te Deum" vespers service of thanksgiving in St. Peter's Basilica. In his brief homily, Francis said the outgoing year had been marked by many tragedies. "(There has been) violence, death, unspeakable suffering by so many innocent people, refugees forced to leaves their countries, men, women and children without homes, food or means of support," he said. But he said there had also been "so many great gestures of goodness" to help those in need, "even if they are not on television news programs (because) good things don't make news". He said the media should not allow such gestures of solidarity to be "obscured by the arrogance of evil".